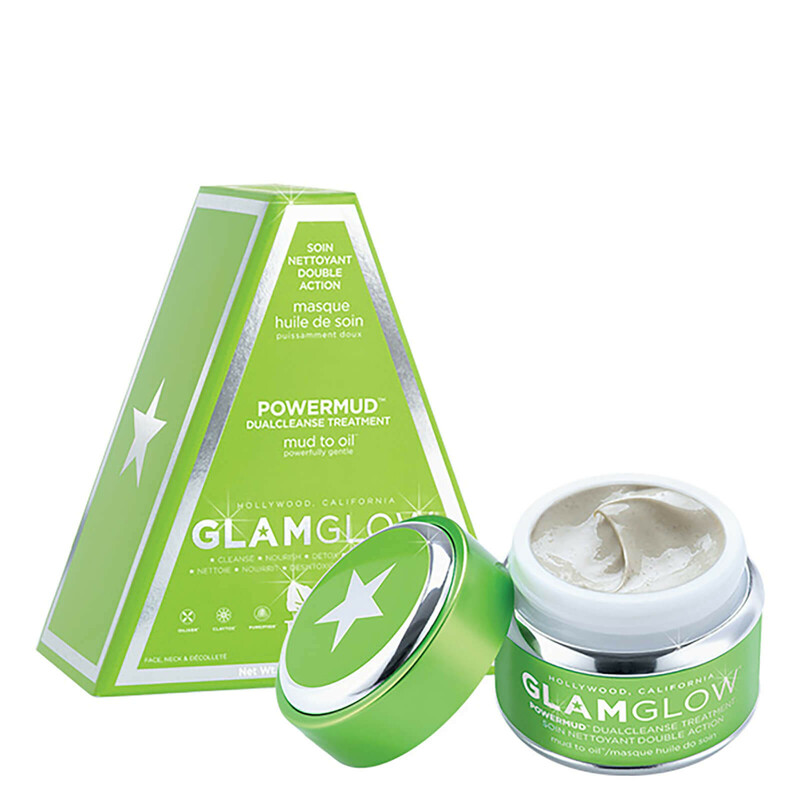 Purify your complexion with the GLAMGLOW POWERMUD™ DualCleanse Treatment; a mud-to-oil formula that delivers a deep pore cleansing action without over-drying or uncomfortable tightness. Harnessing the powers of a detoxifying CLAYTOX™ system with rare Brazilian White Clay, the luxurious face mask effortlessly dissolves dirt, make-up and impurities, whilst OILIXER™ (a nourishing blend of oils) and TEAOXI® Velvet Leaf restore smooth, refined skin with a healthy-looking glow. 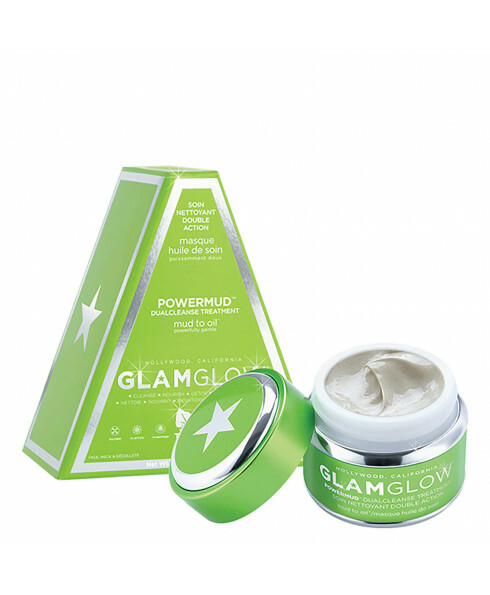 Expect a clear, clarified complexion with renewed radiance. Water, Bentonite, Glycerin, Hamamelis Virginiana (Witch Hazel) Water, Magnesium Aluminum Silicate, Kaolin, Calcium Carbonate, Squalane, Pyrus Malus (Apple) Fruit Extract, Methyl Gluceth-20, Montmorillonite, Niacinamide, Xanthan Gum, Verbascum Thapsus Leaf Extract, Chamomilla Recutita (Matricaria) Flower/Leaf Extract, Lavandula Angustifolia (Lavender) Extract, Sapindus Mukurossi Peel Extract, Verbascum Thapsus Extract, Plankton Extract, Boswellia Carterli Oil, Commiphora Myrrha Oil, Pinus Sylvestris Leaf Oil, Opuntia Ficus-Indica Seed Oil, Oryza Sativa (Rice) Powder, Panthenol, Allantoin, Tocopheryl Acetate, Hexylene Glycol, Ethylhexylglycerin, Ascorbyl Glucoside, Caprylyl Glycol, Urea, Yeast Amino Acids, Betaine, Dipotassium Glycyrrhizate, Leuconostoc/Radish Root Ferment Filtrate, Disodium Edta, Inositol, Taurine, Trehalose, Hydroxyphenyl Propamidobenzoic Acid, Alpha-Isomethyl Ionone, Limonene, Methylisothiazolinone, Phenoxyethanol, Fragrance, Titanium Dioxide (Ci 77891) Please be aware that ingredient lists may change or vary from time to time. Please refer to the ingredient list on the product package you receive for the most up to date list of ingredients.